Having just released their new single 'Land Of The Blind' this past March, it marks the reunion of the original founding members of INFORMATION SOCIETY: Paul Robb (synths), Kurt Larson (vocals) and James Cassidy (bass, keyboards). "The great challenge in making this record was to stay true to the sound our fans know and love," says Paul Robb, "but still move forward and incorporate all the influences we've acquired since the last time we recorded together." "On this record we were aiming to make a classic Information Society album, something that people would have no trouble identifying as Information Society," Robb continues. 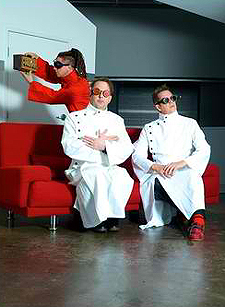 Originally forming in 1982 within the synthpop and New Wave world, Information Society (a.k.a. 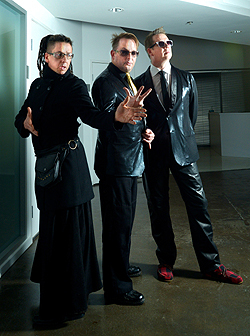 "InSoc") initially broke into the mainstream via the Latin underground with the 1985 freestyle dance single 'Running' which twice became a Top Ten Billboard Dance chart hit – once in 1986 and then again in 2001. Proving its continued endurance, InSoc's original label Tommy Boy Records is releasing a remix record of 'Running' in mid-2014, nearly three decades since it was first released. Chatting recently with Paul Robb I first wondered, as Information Society actually initally made it into the mainstream via the Latin underground with the 1985 song 'Running,' had the band seen themselves as a Latin-influenced band back then, perhaps? "As three naive kids from Minnesota, our popularity with the Latin underground in NYC and Miami definitely came as a surprise. We weren't initially influenced by that scene (since we had no idea it even existed! ), but later on we certainly traded influences and ideas with a lot other freestyle artists. It should be noted that the term "freestyle" did not even exist at the time; that came later. At the time, people were calling it "Latin hip hop"." The band became pop chart darlings later on with multiple Top 40 hits, including the #1 smash around the world, 'What's On Your Mind (Pure Energy).' With all this media hysteria surrounding you, what was it like to be a member of the band in the spotlight at that time? "Honestly, it's hard to remember clearly. On the one hand we were bewildered and excited, but on the other hand we were kind of off-handedly blase, like we expected that to happen the whole time. Welcome to the mind of a 20-something! We complained a lot." And what was the lyrical origin for 'What's On Your Mind (Pure Energy)'? "It's interesting, because if you had asked me that question 25 years ago, I would have said those lyrics were designed to be completely generic and devoid of any authentic meaning, but when I read over them now, I realize they were an authentic expression of how I often felt in my relationships at the time, i.e., "you have to explain how you are feeling right now, because I have no idea"." You said that for this new album you wanted to create a classic Information Society record so that the fans could identify immediately with the sound. Did you accomplish that as you had hoped? "I think so!" Having obviously incorporated some new musical stylings into this new album, what were some of those that the fans can look out for? "Oh, I don't think it's going to be quite like, "There's the dubstep song", and "that one is the moombahton track", but we did take some things we liked from the styles we were hearing around us. As we always have." And was it as easy to record a new album today as it was back 20 years or more ago? "Technically easier, but logistically more difficult. We all live in separate cities and lead separate lives, so scheduling was an issue. We worked it out, though. It only took a year!" This new album Hello World also brings back together the original founding band members. So in what year and importantly who was the first to suggest the reunion, the sessions and then the actual recording? "We've tried this a few times, but only in around 2012 did anyone suggest it seriously...Kurt and I started very casually recording and writing about this time last year. It was a gradual thing, so that no one would be offended if we gave it up again." The name of the new album Hello World seems like an announcement; like you guys have poked your heads into the sunlight after all this time and said, "We're Back!" But what does it mean to you guys? "That, and a few other things...We have always given our albums names that could support multiple interpretations. I don't want to spoil the fun by spelling everything out." What is your favorite track on the new album at this current moment in time - and why? "They are all monumental works of staggering genius. I could never pick just one." Listening to the first single, 'Land of The Blind' I found myself hearing old school Depeche Mode in there. Were they ever an influence on you - back then and now, perhaps? "We've always been grouped in with Depeche Mode stylistically, but strange as this may sound, they've never been a huge influence on us." Back in the day the shortened version of your band name "InSoc" was born. 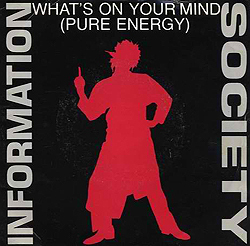 Created, one assumes for all those people that didn't have the time to say Information Society in full, was "InSoc" something the band created - or a media/record label concoction?! "Actually, we called ourselves INSOC exclusively for the first few years. We were trying to echo Orwell's "Ingsoc" and the Soviet/CIA habit of contracting everything into syllables, but once we got signed we decided we needed to get a tad bit less arty and go with the full formulation, Information Society." You have said that when you are touring in 2014 for this new album that you are going to "melt some faces"! Seems a tad bit violent, but what can the "InSoc" fans look forward to live after all this time? "Well, "melting faces" is a James Cassidy-trademarked phrase, and honestly, I'm not sure if I even know what it means. Maybe something like, "We hope everyone will still like us after all this time." We are actually quite a bit better live now than we ever used to be."